Pride of ownership shows as you approach this block and stucco designer home with great curb appeal, beautiful landscaping and painted drive and walkway. You will love the screened-in front porch where you can have your morning coffee while enjoying the water view. This "Grand Ficus floor plan offers a double door entry to the hallway with convenient coat closet. Spacious volume ceilings and the openness of the living area draw you into the home upon entering. 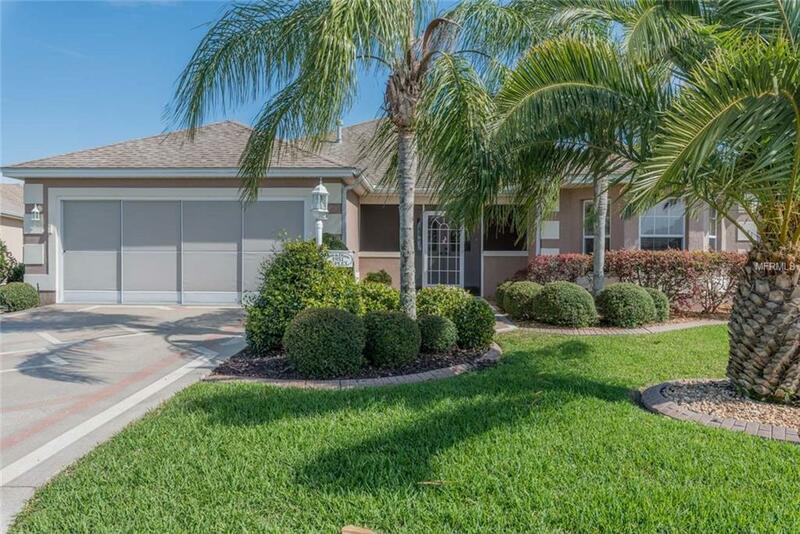 The exquisite kitchen boasts granite countertops, tile back splash, Stainless Steel appliances, and a large dining area with sliders to the oversized lanai. The lanai has been expanded with a screened area that provides a wonderful space to take advantage of the hot tub while enjoying your complete privacy and NO HOME BEHIND. You will find gorgeous laminate flooring in the living room, office/dining room, master and guest bedrooms. The entry, foyer, kitchen, and baths have ceramic tile flooring. NO CARPET in this home. The spacious Master bedroom has sliders leading to the oversized lanai. The Master bath has a large walk in closet, two vanities, and a separate shower area. The large guest bedroom is light and bright from the bay window and also offers a great view of the pond. The inside laundry room is a convenient plus as well. This outstanding home is located within a short distance to the recreation center and family pool.